At least 165 objects in Cairo’s Museum of Islamic Art were destroyed by the impact of an explosion near the museum last week, the antiquities minister said on Friday. A bomb went off last week outside the Cairo security directorate in central Cairo, which is adjacent to the museum, killing four. The terrorist attack was claimed by a Sinai-based jihadist group, Ansar Beit Al-Maqdis. 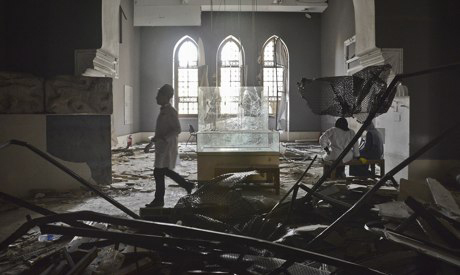 Minister Mohamed Ibrahim told reporters at a press conference on Friday that the museum, the façade of which was damaged in the explosion, would be restored. Ibrahim said that of the 1,471 objects held in the museum, 74 ceramic and glass artefact and wooden items were totally destroyed, 26 were slighly damaged, while 64 artefacts could be easily restored. Six jewellery items are damaged. The minister said that 11 metal armaments and weapons, 18 manuscripts, 16 carpets, 63 tapestries and 67 ivory artefacts are in a good condition. During the conference, Ibrahim announced that USAID granted an amount of LE1,000,000 ($143,000) for the restoration of the museum, while renowned actor Mohamed Sobhi has offered another LE50,000 ($7,000). During their inspection tour, a UNESCO delegate promised to provide a detailed report on the museum within three days. The report will also include a detailed restoration scheme for both the museum’s neo-Mameluke facade and for its collection. Ibrahim also announced that all workers who took part in the rescue effort at the museum after the explosion are to be honoured for their efforts.